There certainly is evidence supporting the old tale of contraband rifles. Yes, Edmonton had a WW 1 home guard and yes, the Legion of Frontiersmen were smuggling rifles. Furthermore, the Mayor was probably in on it! Stories of arms collectors pondering rifles marked LOF have been heard by Frontiersmen over the decades. How do the City of Edmonton mayor, the quasi-military patriots, and the United Farmers of Alberta get tied together with a rifle smuggling story? First, the Legion of Frontiersmen were a quasi-military association of British-Canadian patriots, South African war and Imperial campaign veterans. Their purpose was to act as guides, scouts, pioneers, intelligence gathers, and mounted rifles in support of the British Empire. Fundamental to their doctrine was that every fit man should enlist in wartime; while those debarred by age or infirmity could still give useful service to crown and country. The home guard role was taken up by those Legion of Frontiersmen who were unable to enlist. These Frontiersmen would have actively encouraged recruitment for overseas service and would have provided training in military fundamentals. Concerns about the loyalty of the large number of immigrant settlers may have fueled the idea of a regional security role. Another LF home guard concern would likely have to do with providing manpower support to civil authorities in a time of crisis, as many men were away in active service. Rifles were needed for drill and possible use by the LF home guard units. Mayor W.T. Henry of Edmonton, petitioned Colonel Cruikshanks the officer commanding Military District No. 13 for weapons early on in the war. A letter dated 12th August 1914 from Col. Cruikshanks makes it clear that even the Mayor’s influence could not free up rifles from the army. Mayor Henry then writes, 24th August 1914, to the Legion of Frontiersmen’s Col. H.J. Munton that,”we will have to work along some other lines.” This sets the stage for a Legion of Frontiersmen smuggling operation, apparently with the approval of Edmonton’s Mayor W.T. Henry. Correspondance dated 13 July 1915 to Edmonton LF Command’s Staff Adjutant F.A. Poole of 603 Tegler Block from Francis Bannerman Ordinance of 501 Broadway New York is recorded. “Your letter to the Remington Arms Company has been referred to us for reply.” The letter goes on to say “We can offer you about 1,000 caliber 45/70 Peabody Breech-loading single shot rifles, shooting the metallic centerfire cartridge… . Our price for these guns is $3.85 each. They are complete with bayonets.” Note: Staff Adjutant Poole is referred to as both F.A. Poole and F.W. Poole. Along with the letter about rifles, another letter dated 4th. January 1916 from The Robert Simpson Company Ltd. of Toronto provides a price quotation for uniforms to “F.W. Poole, Legion of Frontiersmen, Edmonton Command, and City Home Guard. ” The letter lists prices: Bedford riding breeches $2.75 each, blue military shirts $1.50 each, regular khaki Service Cap $2.00 and Officers for $5.00 each. Photos of the era show Edmonton Frontiersmen wearing riding breeches, dark khaki shirts, and most wearing a khaki bushranger hat (a common slouch hat, left side brim pinned up, with circular Legion emblem). The “boss of the plains” (mountie) stetson is also noted. Khaki bandannas were worn and the preferred footwear was the riding boot or boot with leather leggings. Reasonable speculation is that the UFA MIC, being recruited by the LF, wore the Frontiersmen kit plus their distinct badge. It would seem that the Legion of Frontiersmen were well on their way to establishing a strong home guard. Public support for the LF was high and even the Lieutenant Governor of Alberta would lobby on their behalf. Collaboration with the Edmonton City Mayor was evident and support of the politically powerful United Farmers of Alberta is demonstrated. Suppliers for rifles and uniforms are in place. The status of the LF was such that funds were being generated by granting the rank of Colonel (Honorary) to generous patrons. At a time when a four room house would rent for eighteen to twenty dollars per month, $100.00 was a contribution subtly mentioned to potential new “Colonels”. An unexpected problem during the LF war effort was the Canadian government’s Customs service. Apparently the importation of weapons at wartime was “frowned upon” and the rifles were seized. Taking Mayor W.T. Henry’s earlier words to heart, “We will have to work along some other lines.” – the local command and home guard smuggled rifles from the USA to Edmonton. In the process of acquiring the rifles from a foreign supplier and then “re-acquiring” the same rifles from the Crown’s ever vigilant Customs Service; one can imagine that the government officials became somewhat disturbed. Apparently, the patriotic zeal of the Legion of Frontiersmen was duly noted, officials were placated, and the matter of rifle smuggling also vanished. The LF carried on with their home guard war efforts and more or less “in step” with the Government’s expectations. The Edmonton Morning Bulletin, 9th May 1916, news article “Frontiersmen Are Willing To Join The Reserve Militia” comments about militia status and the home guard. At the First street Market building His Honour Lieutenant Governor Brett of the Province of Alberta addressed Edmonton’s Legion of Frontiersmen and “expressed his willingness to assist the Frontiersmen in any way possible to governmental recognition as a military body.” 185 of the 190 Frontiersmen present voted in favour of a resolution to join the reserve militia. Further in the report Peter Gunn M.P.P. “holding the honor of being the first Frontiersman of Canada,” reported that “of the many who had joined the colors, there were none who were not at the front.” He also spoke of the late S.W. Caws former Lac St. Anne commandant, who as an aviator was shot down and crashed into German lines. The LF recruited members of the United Farmers of Alberta for the formation of a rurally focused home guard. The article also mentions that “Capt. Rice Sheppard stated 600 men had signed up out of the U.F.A. for a mounted corps.” The district unit badge of the United Farmers of Alberta Mounted Infantry Corps is a gold shield on which is centred the LF’s round British flag emblem encompassing the words “God Guard Thee”. Above the LF emblem are the initials UFA and below the emblem, MIC. No doubt this badge was proudly worn as a mark of patriotism and readiness to support crown and country. The enigmatic smuggled rifles again vanished, but were not forgotten. Legion of Frontiersmen (Canadian Division) HQ of the 1980s, stated that they brushed off inquiries about LOF marked rifles to avoid any difficulties with Canadian laws, or the perception that the LF was still an armed body. The author recalls an annual Dominion Conference at Ft. Scott (Hastings Lake, Alberta) in the early 1980s when the topic of the LOF rifles came up. Brigadier A Mack, Dominion Commandant, made a comment that when DHQ received queries about rifles, his official reply was that he knew nothing about them – this was followed by a chuckle and nod from oldtimers. It was obviously a misleading response because he had written about them in his book circa 1970 (not widely read outside of the Legion of Frontiersmen). The denial about knowledge of LOF rifles was simply to avoid any conflict with laws or the authorities. As a point of clarification, the rifles marked LOF that have been noted on the market are reported to be Model 1876 Winchester carbine 45-75 caliber. This type of rifle was used by North West Mounted Police and Alberta Provincial Police. The Legion of Frontiersmen were resourceful and had solid police connections probably enabling them to acquire Winchester carbines at another time. These would not have been the smuggled rifles that Brigadier(LF) A. Mack of the Legion of Frontiersmen (Canadian Division) had written about. Shortly after the Great War, the Legion of Frontiersmen’s “Edmonton Command and Home Guard” (including the UFA MIC) faded away. The public interest in the LF declined and the war veterans were busy establishing themselves in civilian life. It was not until about 1929 that L.B. Blaine is noted as beginning re-establishment and recruiting for the LF. Under the 1930s command of Lt.Col Louis Scott DCM, an ‘original Patricia’, the LF rapidly became a national force in Canada. However, no one knew what had occurred to the LOF home guard rifles, the 40/75 Peabody’s. It wasn’t until the Second World War 1939-’45, that the rifles re-appear. On 26 September 1940 a local newspaper (Journal or Bulletin) article is headlined “Frontiersmen Find Long-Lost Rifles.” According to the article “a dozen, old-modelled Peabody rifles” were registered with the Edmonton Police. The article states that the Edmonton Command. Legion of Frontiersmen “got possession of the dozen rifles after the first Great War.” This point now adds some confusion as to exactly when LF control of rifles took place. Perhaps the government held the Peabody rifles until wars end. Nonetheless, the LF did get their rifles. The Frontiersmen carried on for a short time after WW1. “When they were temporarily disbanded in 1920 one of the members was given ‘custody’ of the rifles.” By the time the Legion of Frontiersmen re-established themselves around 1930, no one could recall who took charge of the rifles. The old Frontiersman who had been given custody of the rifles placed them in his attic and later died. When his son came in to comply with wartime registration of a dozen rifles, the city police accountant H.S. Reynolds, a Frontiersman, identified them. They have since vanished yet again, but the tale of smuggled rifles carries on in Legion of Frontiersmen’s colourful history. … God Guard Thee. 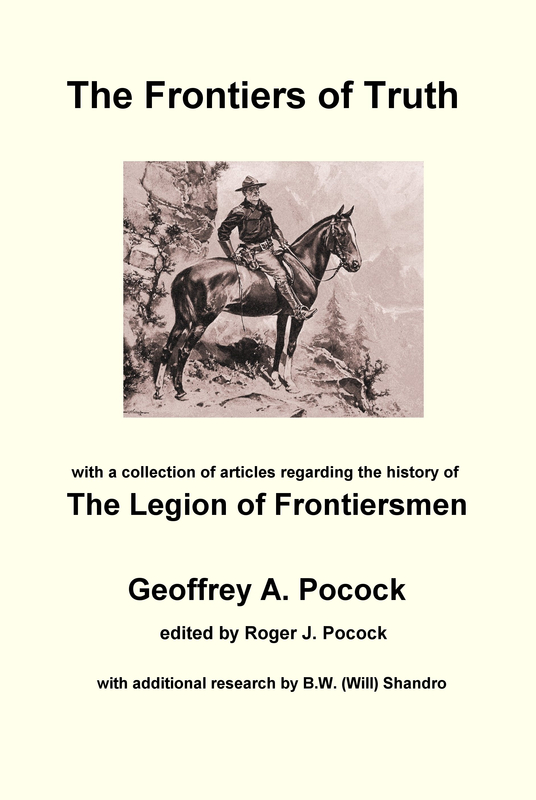 History of The Legion Of Frontiersmen…, c1970, Brigadier(LF) A. Mack. Inspector D. Klancher RCMP (retired), regarding LOF marked rifles. Author’s Observations & Experiences with the LF.